GREC GEESE … Here are just a few of the feathered friends that can be spotted around the Grand River Dam Authority’s Grand River Energy Center (GREC). The site’s ponds have been a haven for all kinds of waterfowl over the years. Since it began operations in the early 1980s, the Grand River Dam Authority’s Grand River Energy Center (GREC) has seen a lot of people pass through its doors. After all, it takes a large team to operate this facility 24/7/365. Home to nearly 1,000 megawatts of electric generation capacity, the GREC is a vital component in GRDA’s overall mission to deliver affordable and reliable electricity. However, even in the midst of all the power production and efficient operations, there is one constant group of visitors that have very little interest in any of the electric generation activities. Instead, these feathered friends are much more interested in the site’s ponds and waterfowl-friendly acreage. In fact, for over 30 years now, the GREC grounds have drawn all sorts of birds, as well as deer and other wildlife. 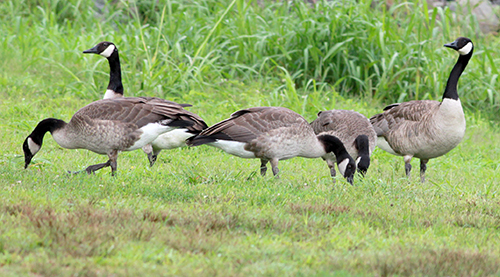 Canada Geese would be considered the most frequent visitors, with some even living and even nesting on site. However, plenty of others are around from time to time to keep the geese company. The list of birds that have been documented on-site over the years is a long one. While some are well known; like bald eagles and Great Blue Herons, others, like the Common Gallinule or Great Egret, are lesser-known but also present. Snowy Egrets and Green Herons have also been spotted along with a long list of ducks, geese and duck-like birds including Mallards, Wood Ducks, Hooded Mergansers, Coots, Buffleheads, Red Heads, Blue-winged Teals, Green-winged Teals, Lesser Scaups, Gadwalls and Widgeons. The list also includes Ring Necks, Canvasbacks, Shovelers, Golden-eyes, Snow Geese and Pintails. With environmental stewardship among its core missions, the Grand River Dam Authority is proud to be a sanctuary for so many species of wildlife, right next door to its round-the-clock, reliable electricity production.